Don't miss out. There's only 5 available and 19 other people have this in their cart right now. Don't miss out. There's only 1 available, and 19 other people have this in their cart right now. 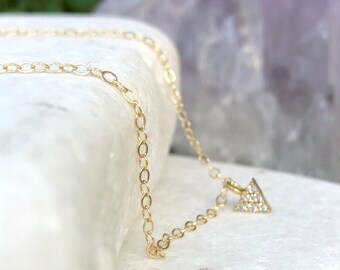 This simple, yet glamorous lariat is a stunning piece that you will wear constantly. Beautiful and sparkly, the delicate chain reflects an amazing amount of light. 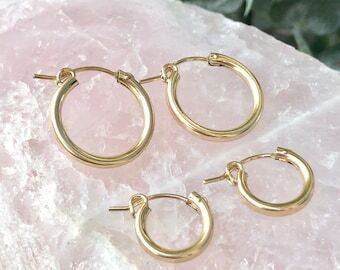 A delicate circle joins the chain in the center so you can slide this lariat to any length, making it extremely versatile. There is NO CLASP on this piece so you can create different looks. 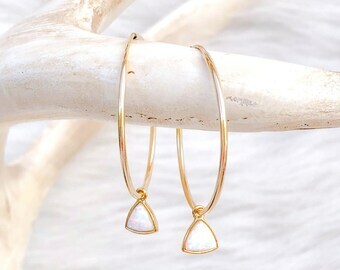 A sparkly opal adorns the bottom. Looks equally as good dressed up or dressed down. 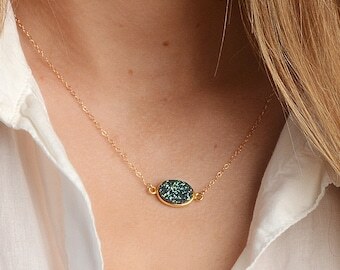 This piece is so gorgeous you will want one of these in gold and silver! 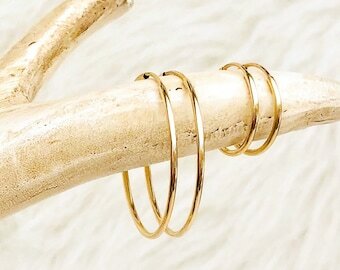 Layers perfectly with any of our Delicate Layers pieces! Completely handmade with love in our sunny SoCal studio. PLEASE MEASURE HEAD BEFORE ORDERING! IMPORTANT: This piece has NO clasp and slips over your head. To make sure this will fit over your head please measure around the fullest part of your head, typically around the forehead area, and add 1/2"- 1" to make sure it will slip easily over your head. If you want a shorter length that won't slip over your head (typically anything under 23") please leave us a note at checkout asking for a "fixed" lariat. Leave your necklace length (16", 17", 18" etc) and we will create the lariat with a clasp. The drop will be 3" to 3.5". Understand that it won't be adjustable if its fixed. 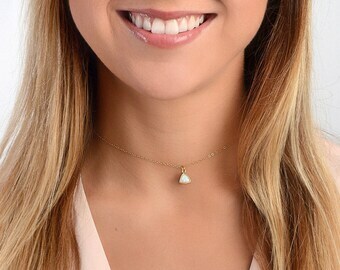 • In the photos the total length is 25"
• You can slide this lariat up or down to adjust the length. • We can customize this to any length but you need to make sure it will fit over your head! Fast shipping, lovely packaging. Very dainty and pretty. 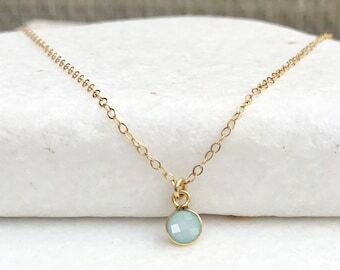 Unfortunately I’ve still not received this necklace I’ve had no notification that it has been delivered and I when I check the order tracking I’m told it is being held pending charges. As I paid for charges up front I’m not happy. The customers item has arrived in the UK and is awaiting a customs fee to be paid. They are in the process of notifying her. The fees she paid to us via Etsy were shipping fees. Unfortunately the UK is one of the countries that does impose customs fees. We have this listed in our shop policies and our international shipping FAQ. This is completely out of our control and we try our best to let people know that these fees can be charged for items going to the UK. We understand that it is never fun receiving surprises that cost the customer extra money. We are sorry for the inconvenience.